Wayne State University Press, 9780814339572, 320pp. The Civil War was the largest and bloodiest conflict ever waged upon American soil, and while no fighting took place in Michigan, both the hardship of the war effort and the heroism of Michigan men at war touched residents deeply. In Father Abraham's Children: Michigan Episodes in the Civil War, Frank Woodford collects personal remembrances of the war from many sources. 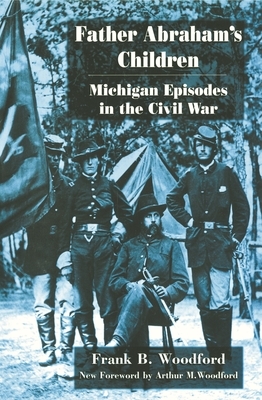 Originally published in 1961 and reissued in 1999, this volume is not a formal account of Michigan's part in the conflict or an analysis of military strategy and wartime politics, but instead presents stories of Michigan soldiers, both as individuals and as units, and their actions, thoughts, and aspirations, presented for the first time in a paperback edition. Among the episodes Woodford recounts with a wealth of colorful detail are Michigan's participation in the Underground Railroad; the strange tale of Sarah Emma Edmonds, alias Private Franklin Thompson; the ill-fated strategy that led to the slaughter at the Crater; an odyssey of escape from Danville and from Libby Prison; the bizarre Confederate plot to capture a Federal sloop-of-war on Lake Erie; the Michigan Cavalry Brigade's exploits under George Custer; the chance encounter with a Michigan soldier that brought death to the gallant Jeb Stuart; impressions and descriptions of camp life and the ordinary routine of a soldier from the diary of Private Frank Lane; the disaster of the First Michigan at Bull Run; the story of Michigan's medical services and the origin of Harper Hospital; the Detroit Riot of 1863; and the nightmare explosion of the steamer Sultana with a death toll of over 1,200 soldiers on their way home from Confederate prisons. Civil War buffs and readers interested in Michigan history will be grateful for the paperback edition of Father Abraham's Children. Frank B. Woodford (1903-1967) was chief editorial writer for the Detroit Free Press. He authored eleven books, including Lewis Cass, The Last Jeffersonian (1951); Mr. Jefferson's Disciple: A Life of Justice Woodward (1953), co-authored with Albert Hyma; Gabriel Richard: Frontier Ambassador (1958), co-authored with Phil Mason; Alex J. Groesbeck: Portrait of a Public Man (Wayne State University Press, 1962); and Harper of Detroit: The Origins and Growth of a Great Metropolitan Hospital (Wayne State University Press, 1964). At the time of his death, he was serving as city historiographer of the City of Detroit. Arthur M. Woodford is the son of Frank Woodford and is author or editor of nine books, including This Is Detroit: 1701-2001 (Wayne State University Press, 2001) and Charting the Inland Seas (Wayne State University Press, 1994). He is the former director of the St. Clair Shores Public Library.